← Who else will be blogging from the Orioles’ press box? One of the nice things about the Orioles’ 40th anniversary celebration of the 1970 World Series championship this weekend is that it puts the players who made this franchise so great back in the spotlight for at least a few days. I sometimes wonder what goes through these players’ minds when they consider the current state of a team that was once a consistent winner. Boog Powell offered his thoughts on both the past and the present during an interesting interview earlier this week with 105.7 The Fan. It sounds an awful lot like what Markakis had to say last week. “Sometimes, guys are going up there and it looks like they have no idea what they’re doing … You need guys in there who have a plan, who have a clue and who know how to execute that plan and get on base. We don’t need every guy in this lineup trying to hit home runs. We’re paid to get on base and figure out how to score and drive in runs. It’s not just about taking pitches for the sake of it or solely to drive up a starter’s pitch count. Smart pitchers will punish you for doing so. Rather, it’s more about forcing the pitcher to either throw you a decent pitch or put you on base. The next question guided Powell back to reminiscing about the 1970 Orioles. However, he returned to a discussion of the current team later in the interview in relation to his low career strikeout total. Cutting down on your swing. That’s music to many fans’ ears. I checked the stats after listening to Powell’s interview and was surprised to find that the Orioles have the fourth least strikeouts in baseball with runners in scoring position. Otherwise, they’re at or near the bottom of baseball for most RISP categories. Here’s where they’re the worst: hits (124), runs (166), average (.215), RBI (160), on-base percentage (.297), slugging (.293), and OPS (.590). Powell continued with the theme of having a plan at the plate, especially with runners on base. This is definitely a problem for the Orioles, who have grounded into the third-most double plays in baseball with runners in scoring position. Powell had somewhat jokingly suggested earlier in the interview that it would’ve been better for him to strike out if he was going to ground into a double play instead. The key issue, as he stated, is plate discipline. And the numbers indicate that the Orioles don’t have it. More concerning than the fact that the Orioles aren’t producing with runners in scoring position is that they aren’t putting nearly enough runners into scoring position. Baltimore has had the third least opportunities (668) of all teams to bat with runners in scoring position. The team’s total is higher than only Toronto and Houston. The top six teams in the category are having themselves some pretty good seasons: Atlanta (first place), Yankees (first place), Rays (second place), Rangers (first place), Red Sox (third place), and Mets (second place). Numbers aside, Powell addressed the emotional side of the argument in response to a question about how much it hurts to see the team struggling for so long. “I feel for the people that come up there every night, especially when we’ve got big Boston crowds and the Yankee crowds and there’s more Yankee fans standing around, and it seems like the crowds are predominantly Yankee crowds and stuff like that. Baltimore has just a wonderful base, a wonderful fan base. The same people year after year after year I see come out to say ‘What are we gonna do? What are we gonna do? Why don’t you come back?’ And I say well yeah I could come back. I says I can still hit, do you want to run for me. I’ll pick somebody. I say if I do it right you won’t have to run very hard. You know, I just kid around with people about it all the time. As fans we feel we deserve better than what we’re getting. 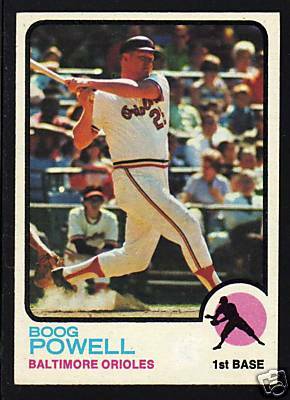 More importantly, Orioles legends like Boog Powell deserve better. Hey! I used to (might still somewhere) have that Boog Powell card! You must be a classic collector. I probably would have some nice older cards to speak of, but my brother always ripped me off in trades by demanding high value in return for anything that was black and white. I didn't know I was getting the worthless "throwback" cards. Once I figured it out I became suspicious of anything prior to the '80s.